Snow days are great times to spend with kids. 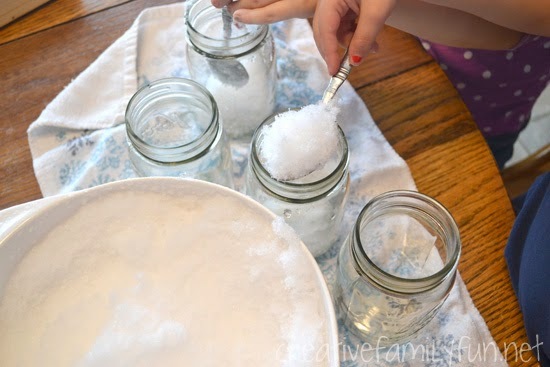 Terri, from Creative Family Fun, gives us some snow day activity ideas that are filled with fun. • Declare a pajama day. After all, if you can’t get out, then why not be comfortable while you’re snowed in? Don your comfiest pair of pajamas and fuzzy slippers. • Light the fireplace. Nothing is cozier than settling down near a roaring fire, so keep the fire stoked all day and into the evening. You’ll enjoy the warmth and crackles while saving on your energy bill too. Roast hot dogs, marshmallows, or chestnuts over the fire for added fun. Watch children closely around an operating fireplace, and never leave a fire unattended. • Cook comfort foods. If you can, plan ahead and stock your freezer and pantry early in the winter so you’ll have the ingredients for your favorite recipes ready to go. You’ll have time to make hearty winter fare from scratch, like homemade bread and muffins, macaroni and cheese, chili, tomato soup, chicken soup, pot roast, or meatloaf. Didn’t have time to get to the store? You may already have the ingredients on hand for these simple three-ingredient peanut butter cookies. • Have a spa day. Pamper yourself with a manicure, pedicure, facial and hair treatments that you may not have time to fit into your regular routine. Soak in a hot bubble bath followed by towels that have been warmed in the dryer. • Read an old favorite book. If you can’t get out to buy some new reading material, go back and re-read a classic or two. • Enjoy a movie marathon. Why choose one movie when you have time to watch several in a row? Choose different movies or a series to view from beginning to end. • Go shopping. Now, you may not be able to get out and go to the mall, but you can still shop online. Snow days are ideal for taking the time to research and compare prices for the items on your wish list. When you’re not rushed, you may be able to find some great deals and new shopping websites. • Play games. What better way to spend a day inside? Get the whole family into one room and make it a memorable experience. Terri says, "Family game night and family movie night are two of my favorite ways to bond with the family in the winter. For family movie night, we like to spread blankets on the floor and have a pizza picnic while we’re watching the movie." • Make a snow day a play day. With a little creativity, children can enjoy being snowed in, too. Stock up on puzzles, books, and art supplies to only be brought out on snow days. Have traditional breakfast or lunch menus reserved for snow days, and keep the ingredients on hand. Have the supplies and instructions ready for a special craft, such as coffee filter snowflakes. If you don’t have coffee filters, try the same thing on a smaller scale with cupcake liners. If it’s possible and safe, bundle up and go outside to play in the snow and burn off some steam. Warm up inside with a special snack of hot chocolate or cider and cookies. Terri says, "When you’re snowed in, it can be so much fun to bring a little bit of the snow inside to have a little fun. You can do science experiments, like this one where we predicted how quickly the snow would melt in different locations in the house. Or you can even use the snow to create! Check out how we used snow as a canvas for our artwork." • Tackle the clutter: If you feel like being productive, start cleaning and organizing. Sometimes spending more time at home can open your eyes to items that could be discarded or areas that could be rearranged. Try tackling a bedroom closet or the kitchen, for starters. • Organize your photographs. Whether you’ve got printed pictures or digital files, a snow day gives you some uninterrupted time to weed through your photos and categorize them. In addition to gaining easier access to your favorites, you’ll likely enjoy taking a trip down memory lane as you work. • Get some exercise. Even if you can’t get outside or to the gym to do your usual exercise routine, you can stretch your legs and stay fit with yoga or calisthenics. Look online or on your television schedule for a virtual class that you can join. • Remember your pets. Snow days can pose special problems for pets, so be sure to give them the extra care they need and protect them from the elements when they go outside. • Start a new hobby. If there’s a new interest you’ve been wanting to try, but you just haven’t had the time, a snow day is the perfect opportunity to get started. If you don’t have the supplies or materials that you need on hand, then spend the day reading, researching and learning what’s involved with your new venture. • Take a nap. Turn on some soft music, tuck in with a warm blanket or throw, and catch up on some rest. With the snow falling outside and the warm comfort of your home inside, it’s a great time for a snooze. While you’re enjoying your snow day, remember to pay attention to your home’s temperature and pipes, which can freeze and possibly burst in extreme weather or if the power fails. If conditions warrant, keep faucets on a slow drip to help prevent your pipes from freezing. You don’t want water damage to ruin your restful snow day. Terri is the mom of two elementary-aged girls and the creator and writer at Creative Family Fun. She has a passion for encouraging families to spend quality time together. She shares simple and creative ideas that anyone can do for a little family fun.